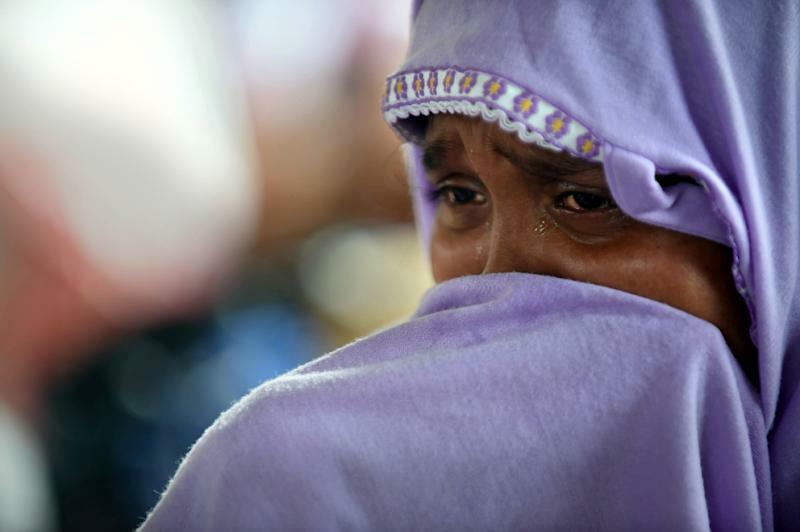 The fate of around 300 ethnic Rohingya migrants whose overcrowded trawler has been bounced for days between Thai and Malaysian waters dramatises the desperate plight of Southeast Asia's new boat-people. 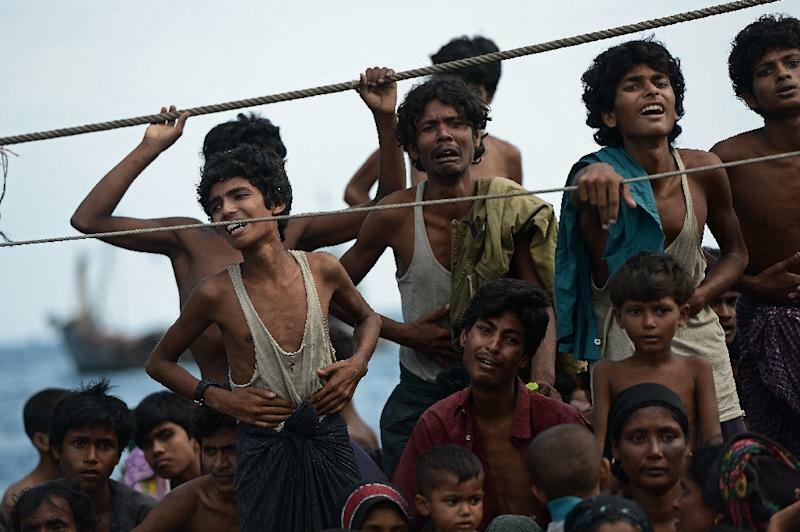 Thousands more migrants from Bangladesh and Myanmar are also believed to be at sea in rickety boats and at risk of starvation. The boat with its miserable, rake-thin human cargo was found on Thursday adrift near the southern Thai resort of Koh Lipe. While the Thai navy gave food and water to the passengers -- many of whom are women and young children -- they have since continued to drift with a damaged engine across the sea border with Malaysia, seemingly unwanted by either country or by Indonesia. The boat's location was still unclear on Sunday as rights groups and journalists scoured the sea near the Malaysia border area for signs of it. But a Thai official speaking on condition of anonymity told AFP the boat was "believed be in the overlapping sea zone between Malaysia and Indonesia". If true, it would reflect a new phase in what a rights group has dubbed "maritime ping pong" between regional neighbours tackling a flood of migrants in recent days. "This boat represents the lack of response and political will to protect Rohingya refugees and survivors of trafficking," said Amy Smith of Fortify Rights. "These are not people who are making choices. They are being forced out of their country." 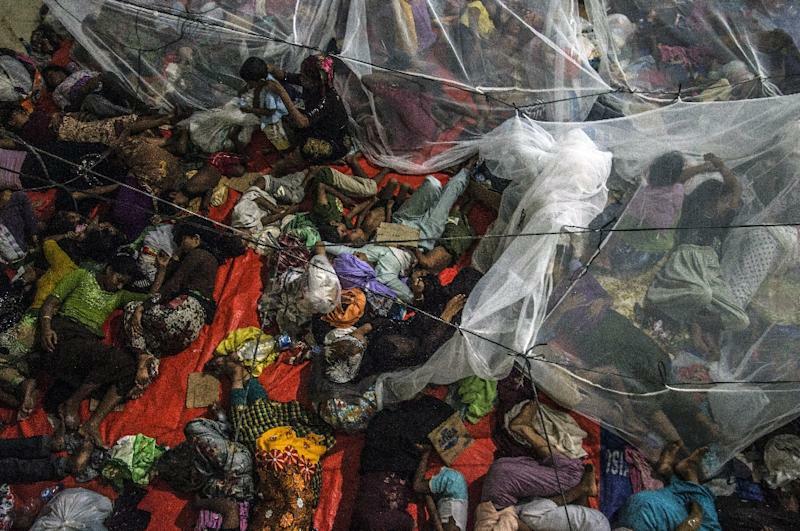 Nearly 3,000 economic migrants from Bangladesh and stateless Rohingya Muslims from Myanmar have reached Thai, Malaysian and Indonesian shores in recent days. Many have told tales of horror during months-long sea journeys, including deadly fights over food between starving passengers and even cases of kidnap for sale or ransom on the regional trafficking market. Several thousand more people are believed to still be at sea, either abandoned or waiting for passage to Malaysia or points further south. The surge of arrivals is thought to have been sparked by the closure of well-worn people smuggling routes through Thailand. The clampdown saw boatloads of migrants abandoned at sea or in secret jungle holding camps. On Sunday Malaysia's foreign minister said he would meet his Thai and Indonesian counterparts this week to try to manage a crisis that has exposed all three countries to international criticism for failing to provide sanctuary to the hungry and desperate. The UN has warned that pushing back migrant boats will lead to avoidable deaths. The regional blame-game has escalated with both Thailand and Malaysia calling on Myanmar to stem the flow of Rohingya, 1.3 million of whom live in the western state of Rakhine. Myanmar maintains they are illegal immigrants from neighbouring Bangladesh. They are denied citizenship and scrape by in appalling conditions. Myanmar "should deal with the Rohingya community internally instead of forcing it on its (Southeast Asian) neighbours," Malaysia's Deputy Prime Minister Muhyiddin Yassin was quoted by local media on Sunday as saying, in an unusually strong rebuke to a fellow member of the Association of Southeast Asian Nations. But Myanmar has so far stuck to its line, denying that the Rohingya exist as a minority group on its soil and maintaining they belong to Bangladesh. It has also threatened to snub planned regional talks on the crisis called for May 29 in Bangkok. Thailand says it has not pushed back any boats during the current crisis. Instead, it says it offered shelter to those willing to disembark from the stricken boat discovered last Thursday, but the offer was declined by the passengers. Late Saturday the Thai navy fixed the boat's engine for the second time and again directed the vessel southwards, the migrants' apparent favoured destination. "They repeated their intention that they want to go to another country, not Thailand," Lieutenant Commander Weerapong Nakprasit told reporters. "We provided them with food, water and some medicine... if there are any new boats coming we will provide humanitarian assistance." The plight of those on board may be further complicated by the presence of people-smugglers who want to reach Malaysia to deliver their cargo and avoid jail in Thailand. Vivian Tan, a UNHCR spokeswoman in Bangkok, said on Saturday the refugee agency had heard that "one or two 'strongmen' were (on board) and trying to influence the group to say they want to go to Malaysia". "But many of those on board clearly need help immediately. No matter what some people on the boat say, whatever it takes, we need to bring people ashore," Tan said.